The away team are out of the running as far as the Euroleague playoffs go but the hosts are still looking to clinch their spot in the next stage of the tournament. They should do this soon and a win against Milan would be virtually all the Greeks need to extend their season. There is a requirement for other results to go in their favour this midweek to have everything rubber-stamped but you can expect Panathinaikos to keep their eye on the ball and focus on what they need to do this week. These sides will clash for the 12th time in Euroleague action this century and in the 11 games that have been played so far, it is the Greens that hold the advantage, having won eight of these clashes. The last time these two teams met, it was in Milan, and it was an away win thanks to a 72-86 win. There were 19 points and 7 rebounds from Mike James on the way to the Panathinaikos victory and he has been a key player so far this season. With a total of 12.8 points per game so far this season, James has led the way for Panathinaikos on many occasions and you can expect him to have a say in how this game unfolds. It has been a very tough year for Milan but Rakim Sanders have been a big player, offering an average of 13 points per game. Kruno Simon has also been involved, providing an average of 11.1 points per game but with injury blighting his campaign, there will no doubt be one or two “what-ifs” about the Milan season. Other players who have performed well for the hosts include Chris Singleton, with an average of 12.3 points per game and KC Rivers, who has notched an average of 11.4 points per game. Both teams have players who can make a difference but when you look at Milan’s statistics, you can see why they are well out of the running. Milan actually have the fourth best offensive record in the league, averaging 81.9 points per game but they have the poorest defensive record in the league, letting up an average of 88 points per game. 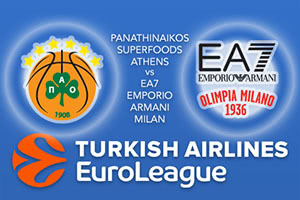 The hosts should race away with this so take Panathinaikos Superfoods Athens at -11.5 at odds of 1.90. For the Over/Under market, go OVER 158.0 at odds of 1.90. Bet Now!